Why Study Business at LAU? Ms. Vana Saade discussed different master degree programs available at her company’s two biggest institutions. 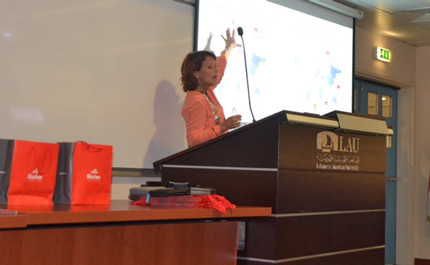 The Hospitality and Tourism Management program hosted Ms. Vana Saade, Regional Director of Southern Europe & MENA for Sommet Education, for a talk on her company’s two biggest institutions: Les Roches Global Hospitality Education and Glion Institute of Higher Education. Ms. Saade discussed the different master degree programs available at both universities and the benefits LAU hospitality students will receive upon applying to them.